The Mercedes AMG F1 W03 was destined to be the car for Mercedes to step up after two year of relative trouble and disappointment. There's certainly no lack of knowledge in the team's management with Bob Bell, Ross Brawn, Geoff Willis and Aldo Costa all very experienced men in Formula One. The car was launched on 21 February at Circuit De Catalunya, Barcelona, after which it immediately kicked off in testing. The launched car was a thorough development of the W02, with a surprisingly elegant solution to the stepped nose with the front of the monocoque featuring two bumps on each side, creating a smoother transition of airflow over the centreline of the car. Other than this, the car was fairly conventional at first sight. However, the Mercedes soon proved to have a secret weapon under the hood, as it contained a revolutionary double DRS system (DDRS). When the driver activates the usual DRS to open up the uppermost rear wing flap, two apertures are created in the rear wing endplates. These apertures catch high pressure air and feed them through two pipes going through the endplates, the beam wing, through the sidepods along the radiators, along the driver up to the front wing, where small slots feed this air underneath the front wing elements. Similar in principle to the F-ducts of 2009, the DDRS of Mercedes attempts to stall the front wing when little downforce is needed. The system triggered protests at the first race of the season by other teams, claiming it a moveable aerodynamic device. All protests were however denied, allowing the team to continue to use the system, knowing that it would be difficult for others to create quick copies of it. As the season progressed however, the team found out that the system failed to live up to its expectations, and even at the final GP of Brazil dropped it altogether, knowing that it was to be banned for the 2013 regulations. 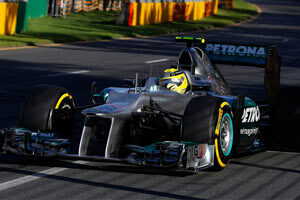 The start of the season was promising though with the cars qualifying 4th and 7th for the Australian GP. The next race, Rosberg was 10th and scored the team's first 2012 points. In China, the third race of the season, Nico Rosberg took pole and dominated the race to take his first F1 race win, as well as the first for the team after being bought by Mercedes. Rosberg recorded another podium with second place at Monaco while Michael Schumacher finished third at the European GP at Valencia. By then however, the team was clearly slipping away from the forefront, struggling harder to qualify in the top 10 and usually failing to maintain position during the race. Tyre issues doomed again after Mercedes hoped it was solved after it proved such a struggle with the Mercedes GP W02 as well. Unfortunately for the team, it wasn't, and Bob Bell later also declared they struggled all year with getting the front tyres warm enough and keeping the rear tyres cool enough. The usual car balance strategies to resolve this however created terrible understeer, making it unable for the drivers to push the car to its limits. At the Spanish GP, and the next at Canada, the team introduced a major upgrade package, including a brand new carbon fibre gearbox casing which was smaller and allowed the team to introduce a revised rear suspension, requiring different connection locations for the wishbones. At the same time, it allowed the introduction of a new aerodynamic package, including a wider and flatter nose and a tighter rear end. It also increased the car's torsional stiffness, but eventually didn't bring Mercedes back to the forefront as other teams were seemingly more efficient in their developments. In essence, the team fell behind in aerodynamic development due to focusing on the wrong topics. In the front area, top teams as McLaren and Red Bull were improving the flexibility of their front wings, while Mercedes was entirely focused on trying to improve its DDRS. At the rear, it became more and more obvious that a Coanda style exhaust as on the McLaren MP4-27 or a ramp exhaust a la Sauber C31 was the way to go. Mercedes realised it too late, and decided to develop a version for their car, introduced at the Singapore GP. Due to hurrying the system on the car, it wasn't the big improvement they expected it to be, while it also further increased the car's inherent problem of overheating the rear tyres. It was too little, too late, and eventually at the final race of the season, Mercedes reverted to the traditional exhaust to at least be able to get some consistent data for use in the 2013 development programme. The car finished the season a distant 5th in the constructors' championship, having scored one win, one pole position and 2 further podiums.